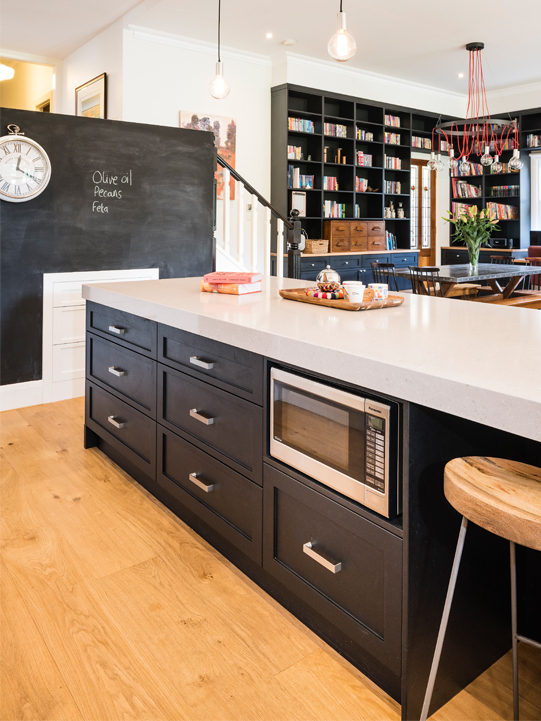 This beautiful and playful contemporary kitchen designed by Laly Renehan was constructed by Smith & Smith Kitchens. The composition, balance and subdued colour palette combine to deliver a functional and personalised space. 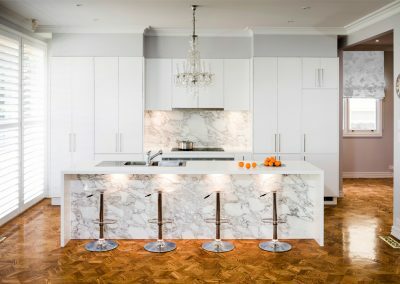 The kitchen was built to accommodate the clients’ five young children, with functionality of the space taking top priority. 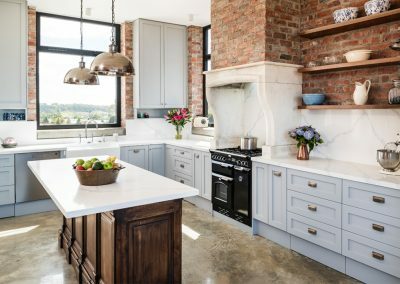 For this reason, the design was split into zones to allow for maximum efficiency – including a food preparation area, a wet area, a cooking space and food storage. 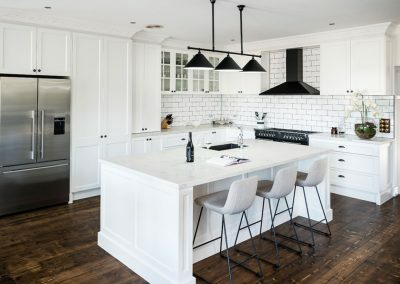 A white splashback with glossy subway tiles delivers a refined industrial appeal. 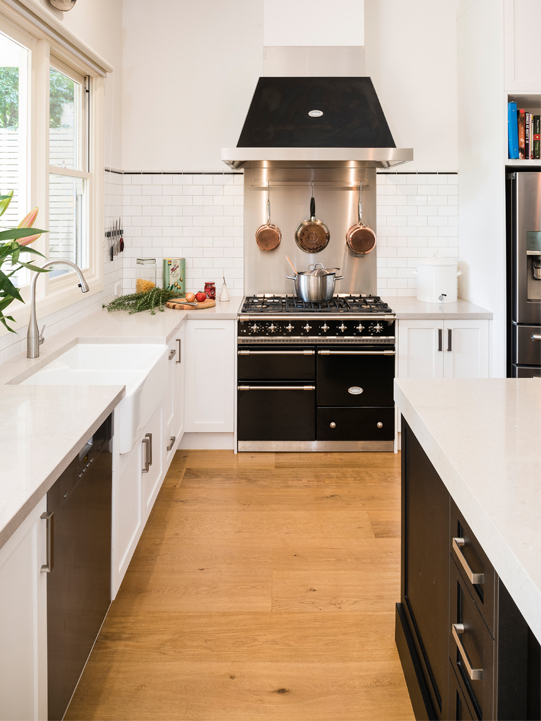 The black line across the top of the tiling aligns perfectly with surrounding elements to outline the cooking and food preparation zones, as well as amplify the height of the ceiling. 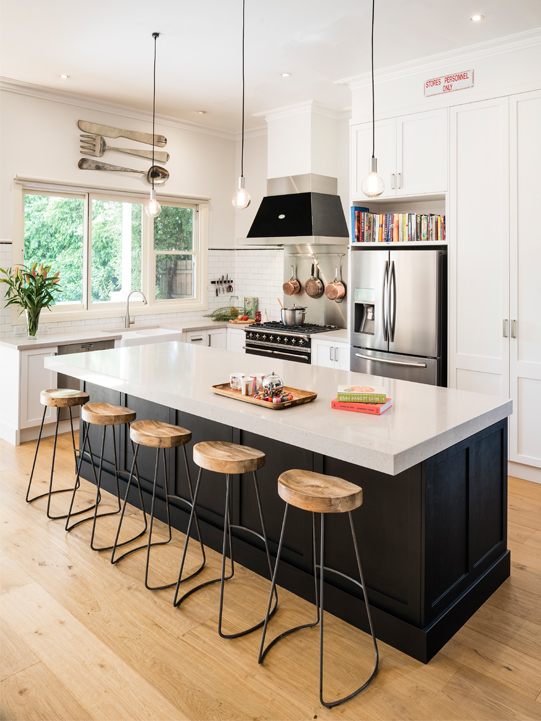 The kitchen features a beautiful mix of country and industrial design elements. 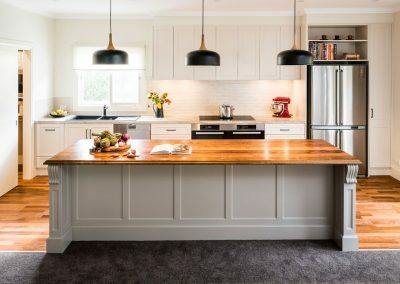 The lofty ceilings of the Edwardian weatherboard cottage give an air of grandeur to the humble country styling. 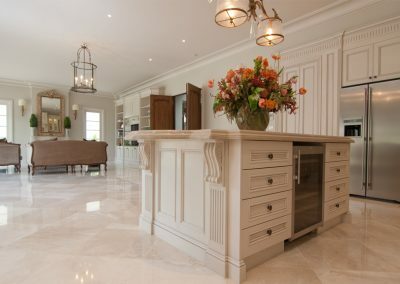 The clients were involved throughout the design process and added their own creative personality to the kitchen. The inclusion of the blackboard against the stairs provides a useful and fun addition for their children. 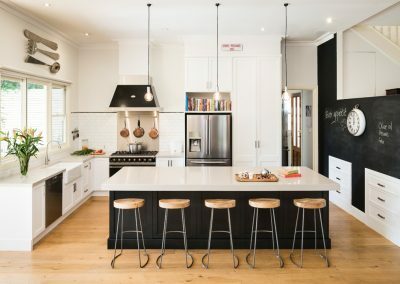 The whimsically large cutlery art on the wall opposite shows the clients’ unique artistic flair, as does the reclaimed factory sign, oversized clock, and stools, which are cohesive with the industrial aesthetic of the kitchen. 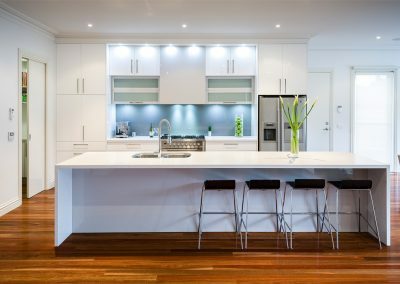 To create a space where a family could congregate, Smith & Smith Kitchens included a 3m island bench. 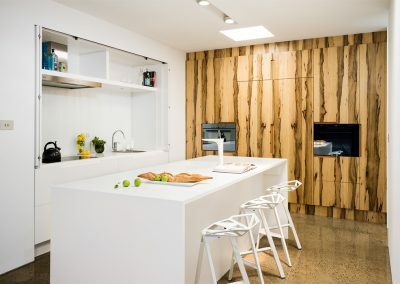 The island was centrally positioned to create a sense of arrival in the space. It was placed on the existing wide-oak flooring, which is complemented by the stools. 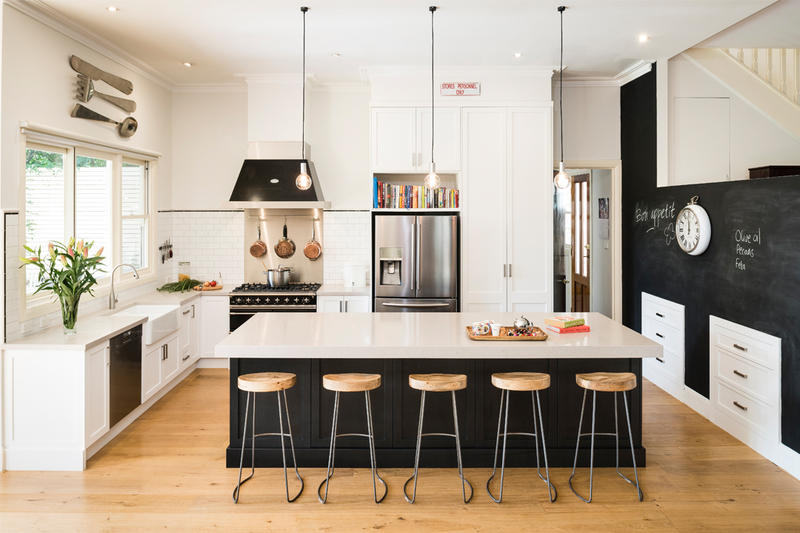 Painted in Dulux black, the island bench blends seamlessly with the rest of the kitchen. 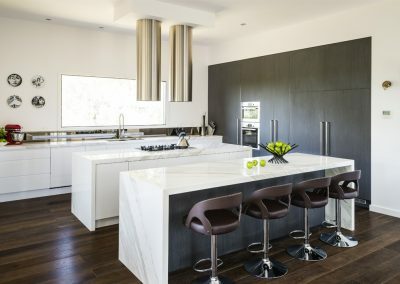 The Caesarstone ‘Clamshell’ benchtop contrasts strikingly with the dark base of the island. Smith & Smith Kitchens included exposed-filament Edison light bulbs in the design, which hang over the island bench. All of the finishes were kept matte to be consistent with the industrial tone. The shaker-profile two-pack cabinetry features Dulux ‘Lexicon’ paint in a matte finish, which blends beautifully with the blackboard. 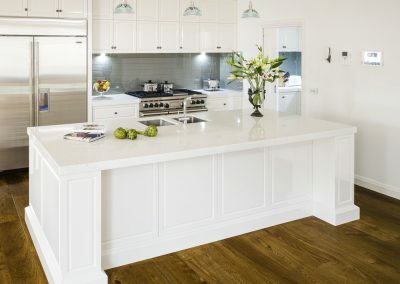 The drawers are all fitted with soft-close mechanisms, while the cabinetry doors along the back of the island bench feature press latches to ensure the safety of the young children. 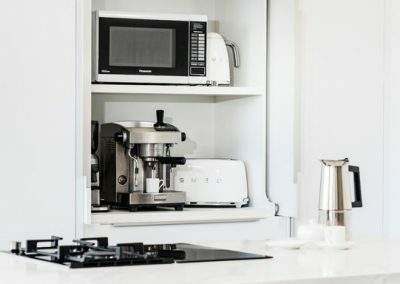 The corner cabinet has a Häfele revolving carousel for easy access. 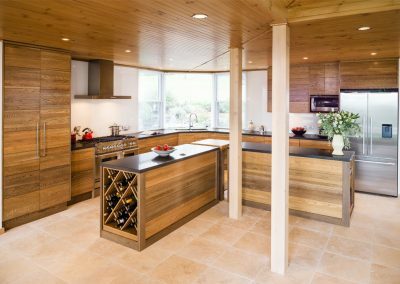 The microwave is strategically concealed within the island bench to ensure the stove remains the centrepiece of the kitchen. The cabinetry also hides the hands-free, electronic-opening Häfele bins, which are placed at bench-level for optimum sanitation. 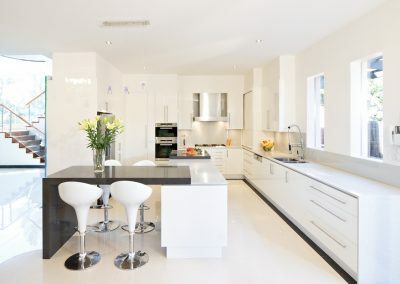 The kitchen is 3.2m x 5.5m, with the ceiling measuring 3.3m. 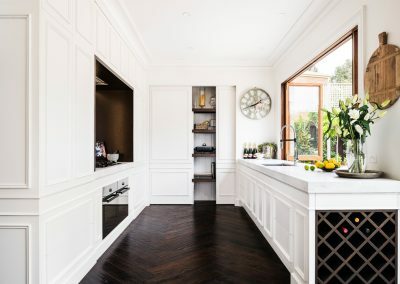 Smith & Smith Kitchens experienced some difficulty removing the existing built-in pantry and replacing the cornices with a gutter-style Victorian cornice due to the tall ceilings. The team used careful planning and on-site problem solving to ensure all obstacles were overcome with efficiency. No overhead cabinetry was included in the design to ensure the kitchen felt spacious. The drawers within the stairs feature brushed nicked handles, which add a touch of sophistication. The butler’s sink is centred under a large window that allows abundant natural light to enter the space. The elements of stainless steel are mimicked in the Samsung double-door fridge and the Miele dishwasher. 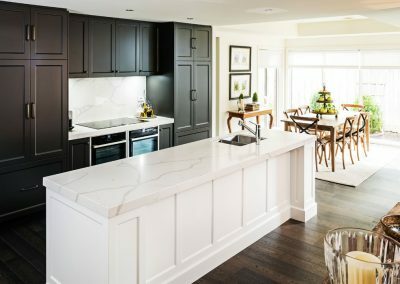 Smith & Smith Kitchens is a company that takes pride in its ability to provide homeowners with beautiful cabinetry for all rooms of the home. From kitchens and bathrooms to studies and libraries, there is no limit to the talented team’s abilities. 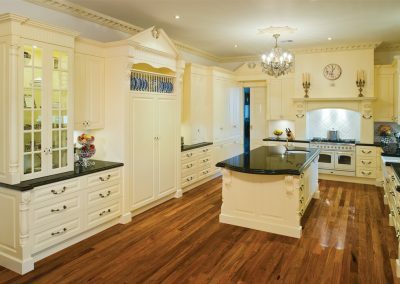 Established more than 30 years ago, the Smith & Smith Kitchens team is comprised of designers, interior designers, and architects. 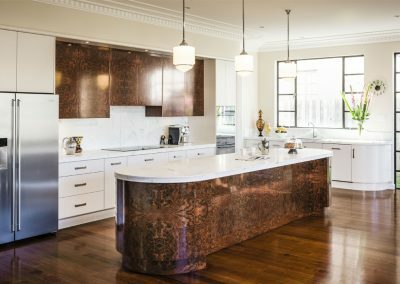 Servicing the Melbourne metropolitan area, Smith & Smith Kitchens has proved itself as an industry leader time and time again. With the capacity to create exceptional spaces in any style, there is very little the talented team can’t achieve.